BEIRUT, Lebanon (CNN) -- The tribunal established to prosecute people allegedly responsible for the killing of former Lebanese Prime Minister Rafik Hariri and 22 others will officially convene at The Hague in Netherlands on Sunday. 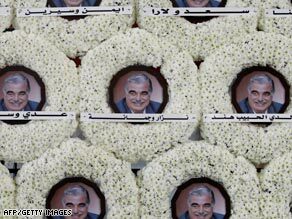 White wreaths with photos of Rafik Hariri at his tomb. The car bomb in Beirut in February 2005 transformed the turbulent nation's politics and sent shock waves across the Middle East and the world. "All the necessary measures have been taken for the Special Tribunal for Lebanon to commence functioning," U.N. Secretary-General Ban Ki-moon wrote in his latest report to the U.N. Security Council. Daniel Bellemare, a Canadian, will be the U.N. tribunal's prosecutor. The trial judges and appeals chambers will take on their responsibilities on a date determined by Ban and the tribunal's president. The United Nations says the case is expected to be ready for trial by 2010. At the time of Hariri's death, neighboring Syria had immense political influence Lebanon, where it had had a troop presence from the 1980s, after the fighting between Israel and the Palestine Liberation Organization in Lebanon. Hariri was admired for spearheading the rebuilding of Beirut after the country's civil war, from 1975 to 1990, and many Lebanese blamed Syria for the killing, citing Hariri's patriotism and strong sense of Lebanese independence. The killing sparked widespread protests that led to the eventual withdrawal of Syrian troops from Lebanon and the election of an anti-Syrian bloc in parliament. The anti-Syrian movement is known as the March 14 Alliance, named after the day millions of supporters of Hariri took to the streets, and its actions have been dubbed the Cedar Revolution, for the nation's iconic cedar trees. Along the way, U.N. investigators tasked to probe the attack found links between Syria's government and Hariri's assassination. Three people detained for three years in connection with the case were released Wednesday by a Lebanese judge. Four Lebanese generals who have been held for nearly four years in connection with the attack remain in custody. The Lebanese hope the tribunal will settle the case, but there are also fears it could further divide the nation and open up older wounds in the country. Rami Khoury, a political analyst and a professor at the American University of Beirut, said the tribunal could serve as a political flashpoint, but he said the existence of the tribunal is important. "It's an extraordinary symbol of the whole world coming in here, to the Arab world, and saying this has to stop, we're going to find who did it and hold them accountable," he said. "So it's tremendously important, I think, in what it represents." The special tribunal takes over from the Beirut-based International Independent Investigation Commission, which looked into 20 other attacks and found elements linking some of them to a criminal network behind the Hariri killing, the United Nations said.